1.Harvesting begins in autumn; black olives are usually harvested from November to February while green olives are harvested earlier. Olives can be picked by hand or beaten from the tree (usually with flexible poles so that the olives fall onto canvases placed at the bottom of the tree), they can also be harvested using mechanical tree shaking methods. 2. Transportation follows the collection process. The fruit is placed into bags, baskets or trucks in bulk form and then transported to be pressed. Care must be taken not to damage the olives during transportation and to avoid fermentation due to the lack of ventilation. On arrival to the mill olives are washed and separated from their twigs. Olives must be processed within 24 hours after they are harvested to obtain quality olive oil. 3. Crushing of the olives including the pit in order to break the skin and crush the pulp. - Continuous system by centrifugation, the paste is made more liquid by adding 1 litre of water per kilogram of paste. 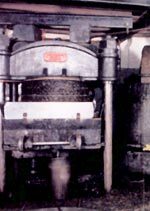 The centrifugal decanter spins the olive paste in a horizontal drum with the heavier flesh and pit going to the outside and the water and oil is tapped off the centre. The oil we have from the oil presses at this stage is natural olive oil. There is still some oil in the residues that accumulate in the oil-presses. These stacks of residue are called oil-cake and contain some oil, depending on the efficiency of the oil presses. This oil is known as seed-oil. 5. Storage . Olive oil is sensitive to light oxidation which speeds up when its colouring substances come in contact with sunlight, room light, etc. For this reason the storage of olive oil in dark glass bottles is ideal however if the bottle is transparent, it should be kept in a dark place. Ideal storage temperature should be 10-15 degrees Celsius.